I had a really odd one today. A client had added text to a submenu page that was either empty or just had an image. 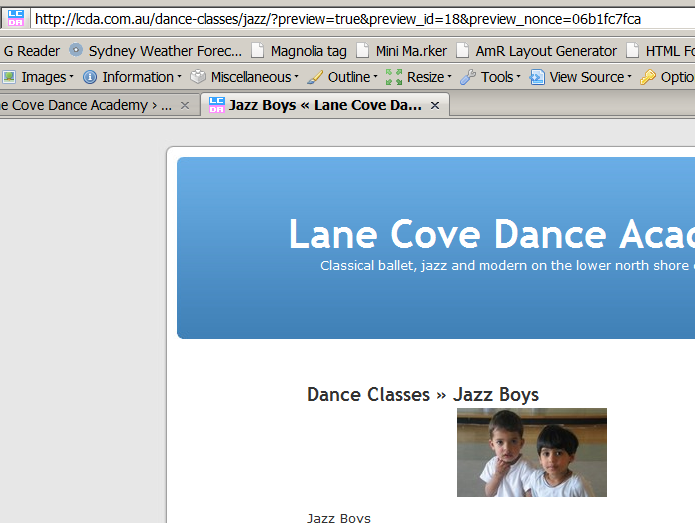 Once she had saved and wanted to view the page, wordpress just kept bringing up a set of images with the page slug in the title (‘jazz’). One could not get the page itself to display, not in preview, not at all and not even when following the menu tree. The image was displayed along with others in the parent page – intended as a kind of image list to the sub menu pages. I suspect that somehow this was causing the problem getting to the correct sub menu page. 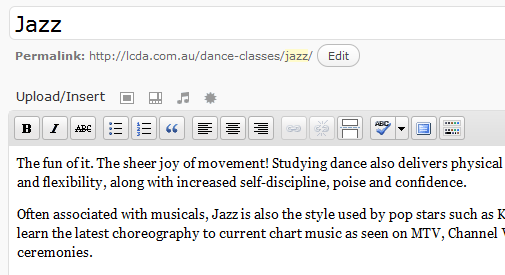 The page can be edited from the admin area, but is not displayed in anything other than edit mode unless one changes the “slug” to something else (eg: ‘jazz classes’). One can reverse the process – ie: change the slug back to ‘jazz’ and the problem comes back. Changing the title does not seem to make any difference. I had not yet upgraded to 2.7, so I did that – actually to 2.7.1 now in the hope that that would fix it, but no, the behaviour remained. It was also happening on other similar pages (eg:’ ballet’). Just to be sure I switched to the default theme and it’s the same.